Is it a wasp? Is it a spider? Is it a fly? It’s actually a tiny drone conducting a military surveillance mission.Tiny intelligent flying and crawling robots, inspired by insects and animals, could soon help the armed forces. The Micro Autonomous Systems and Technology (MAST) program is the Army Research Laboratory’s collaboration with a number of teams drawn from industry and academia. The 10-year initiative, which began in 2007, aims to create intelligent next generation micro robots. BAE Systems is the industrial lead for the project, which also involves the NASA Jet Propulsion Lab, University of Maryland, the University of Michigan, and the University of Pennsylvania. The MAST-inspired micro robots could provide U.S. ground forces, small units and individual soldiers with the capability to conduct surveillance within complex urban environments and difficult terrain – significantly increasing their safety. 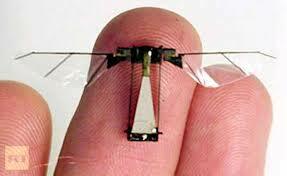 One BAE Systems prototype looks like a fly and weighs less than an ounce. Its lightweight carbon joints help the robot imitate real flies. With a wingspan of just over an inch, its wings beat 110 times per second. The University of Pennsylvania’s smallest robot weighs less than three quarters of an ounce and is very quick – travelling at about 53 body lengths per second. Other tech resembles spiders and lizards. How could these micro robots be used? The robots could be sent on missions to collect lifesaving data for frontline troops. MAST hopes to produces lots of different microbots that will give soldiers additional eyes and ears for different environments. In urban, rough or complex terrains, the microbots could be particularly useful for small units, giving them better situational awareness. Microbots can capitalize on their size to move quietly and easily access small spaces. If a unit approaches a building and needs to know what’s inside, for example, the soldiers could deploy a reconnaissance team of microbots. The robots could penetrate the building undetected, search the interior, map the layout, and provide data on the building’s occupants and their locations. Soldiers may also need to enter areas where GPS technology won’t function, such as underground. This would be another scenario where the microbots could provide 3D mapping and navigation. They could also be used to detect and track people or to locate threats such as explosives and bomb making materials. The bots will know the relative positions of their robot counterparts and can detect obstacles in the path of the mini surveillance team. The flying mini-drones will also detect obstacles and threats located above, below, at either side and behind the microbots. Ground-based versions of the technology will be able to adapt their method of movement to different terrain. The University of Pennsylvania has been working on giving their robots the ability to automatically reconfigure and adapt to both human commands and their environment. To ensure that these microbots can be monitored and managed as groups, the team is creating cutting-edge methods of sensing, communication, control and computation. The robots will be able to operate on their own and may eventually be equipped with a range of sensors for location and orientation. They may also provide additional data from audio, thermal, magnetic, and chemical sensors. 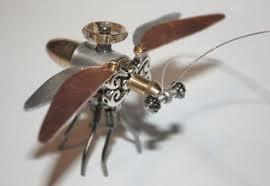 Insects and other animals have been key to developing the mini drones. Working out how insects sense their environment, move around and react to threats is leading to breakthroughs. The Army Research Laboratory, for example, has studied scorpion biomechanics. The hairs on a scorpion’s arm can sense vibrations and identify threats in its environment. Researchers want to replicate this capability, allowing a robot to detect footsteps and, if necessary, hide. The scorpion’s tail system helps it change its center of motion and gravity. Scientists have also been looking at building a robot version of a scorpion’s tail, which helps the arthropod change its center of motion and gravity.